North East Rural Living Fair. If you have an interest in learning how biodynamics works and applying it to small and large scale farming as well in the garden, this is your opportunity. Hear from experienced Bio-Dynamic farmers – market garden extraordinaire Darren Aitken of Vortex Vegies in Inverleigh, and pear and apple grower Lynton Greenwood of Greenwood Orchards in Merrigum. Cost: $100. Seasonal Gardening – What to plant where. Hosted by Corowa District Landcare. Gold coin donation appreciated. 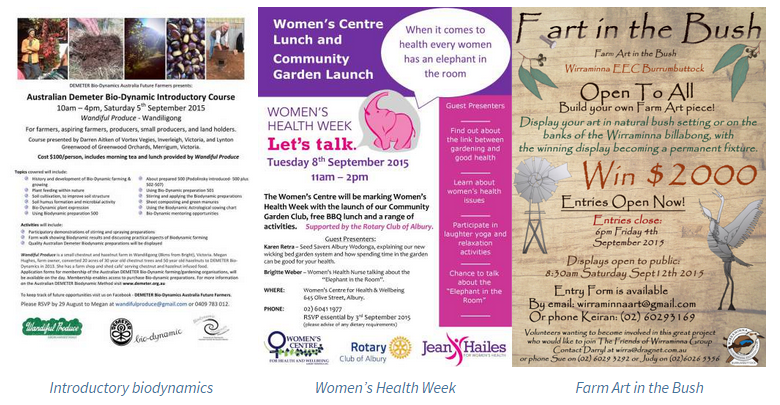 Activities to mark women’s health week, including gardening in their new wicking beds supported by Seed Savers Albury-Wodonga. Recycling and imagination come together at Wirraminna’s F.art in the Bush. Last year’s successful event attracted 30 local and interstate artists with many visitors travelling hundreds of kilometres to attend. All enjoyed Wirraminna’s unique setting of wetlands, bush and landscaped areas linked by walking tracks while viewing the displays. The focus of this event is to promote sustainable rural living, in particular self sufficiency skills. Some examples of what will be highlighted include bee keeping, organic gardening, preserving and biocontrol. There will be children’s activities, presentations, workshops, educational displays and musical entertainment. The event is hosted by Wooragee Landcare group and supported by North East Regional Landcare Facilitators.